The most inspiring music and art filled week has come to an end – after the vibrant Robert Plant and his band - The Sensational Space Shifters, Positivus Festival has closed its gates until next summer. The festival organizers are incredibly thankful to all 30,000 visitors, who not only enjoyed the special Positivus programme, but also helped shape the unique Positivus Festival atmosphere during these three days. The organizers invite everyone to return next year - to celebrate the festivals first decade together. Each festival can boast an increasingly diverse and international visitor turnout – it is now becoming more challenging to find a country that wouldn’t be represented at Positivus – the festival even gathers visitors from faraway places like Hong Kong, Qatar, Morocco, Malaysia, Mexico, Laos, Kenya, China, Australia and Brazil. International journalists were also in high attendance this year – the festival was visited by almost 300 journalists, with two-thirds of them arriving from foreign countries near and far. Positivus ’15 main headliners were the rock legend Robert Plant and The Sensational Space Shifters, cult-status musicians Placebo and Brit rock superstars Kasabian, with other artist shining just as brightly on the other six stages, including fan favorite Tom Odell, skillful female rockers Warpaint, style chameleon St.Vincent, pop/punk princess Charli XCX, intellectual pop-rockers The Sound Poets and many, many more. Each Positivus visitor surely had their own favorite performance, but as we saw at shows both big and small, visitors were often captivated by smaller scale artists as well. The special Positivus ambiance was also created by improvisation shows and circus performances, movies and comedic stand-ups, various attractions and activities for the most diverse tastes and interests, as well as the awesome festival visitors themselves. Wow @positivus was amazing, really enjoyed the gig and getting to watch/hang with @kinggizzardband. 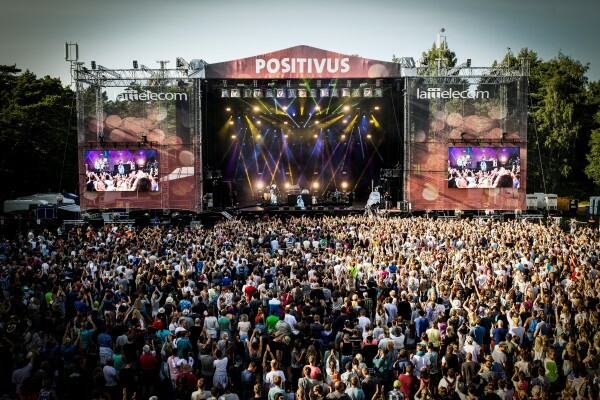 You can reminisce about the best Positivus Festival ‘15 moments and start getting in the mood for next year’s festival on the Lattelecom interactive TV channel 360TV Positivus only until August 2. See you at the tenth Positivus Festival in Salacgriva in 2016!